Call of Duty: Advanced Warfare is released in just a couple of weeks. To celebrate, we’re giving away a brand new PlayStation 4 and a special Atlas Edition copy of the game! We’ll also be giving two runners-up a copy of Advanced Warfare on a platform of their choice. To be in with a chance of winning the gaming goodies, all you need to do is sell a selected game before Tuesday November 4th. You can find the full list of eligible titles below; with over 50 games, you’re bound to find something you own! There really is nothing to lose: you’ve got 3 chances to win, you’ll get cash for your games and you can send them using our FREE Courier Service – you don’t even need to turn your console off! 3. 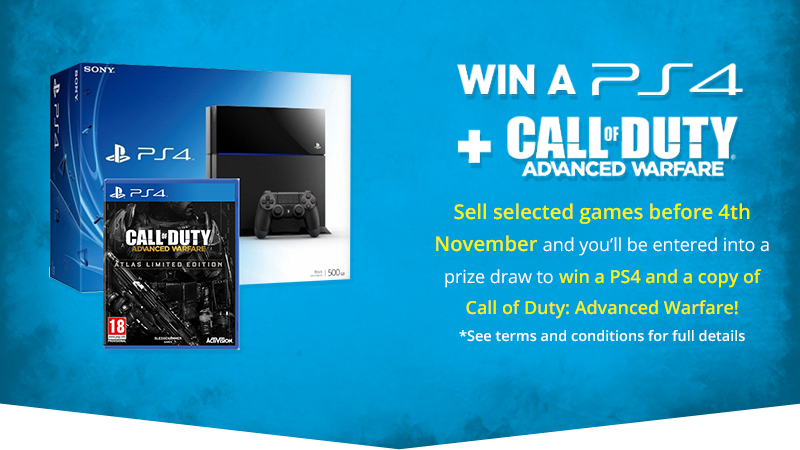 Be in with a chance of winning a PlayStation 4 and Call of Duty: Advanced Warfare Atlas Edition (or a copy of the game on a platform of your choice).